4-Word Review: Don’t idolize older brother. 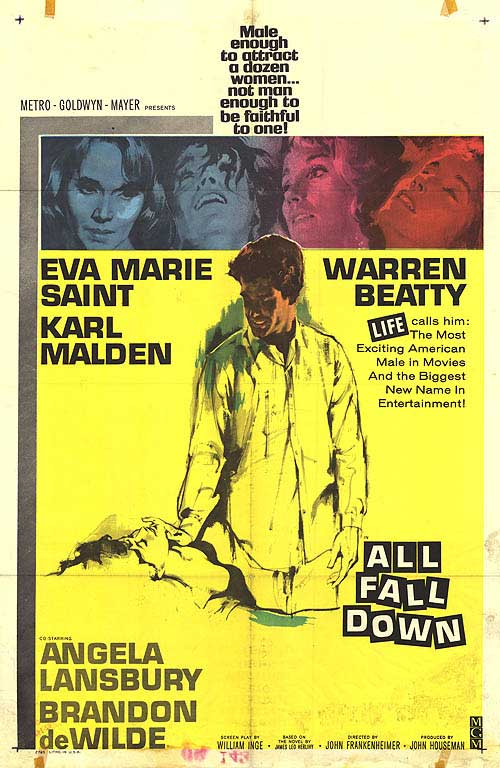 Berry-Berry (Warren Beatty) is the malcontent son of Annabell and Ralph Willart (Angela Lansbury, Karl Malden) who is unable to hold down a steady job, is in constant brushes with the law, and beats up his girlfriends. Yet women seem attracted to his rugged good looks, his parents continue to dote on him and overlook his flaws and his younger brother Clinton (Brandon De Wilde) idolizes him. All that changes when Echo (Eva Marie Saint) comes to visit. Clinton falls for her, but when she meets Berry-Berry she instead goes for him. When he mistreats her Clinton finally sees his brother for who he is and decides to take matters into his own hands. Although overall this is a great production one of the biggest problems I had with it is the name for the leading character. Who names their kid Berry-Berry? I have never heard of that name before and it sounds corny and silly even annoying every time it comes out of one of the character’s mouths. I was almost surprised that the actors didn’t crack-up every time they had to say it. I felt there should have been an explanation for it, but none ever comes. In my mind giving a kid that stupid name is probably the whole reason he became so troubled and difficult in his adult life. As for the character itself I wanted more of a history to see why he became the way he did. There is no backstory and in that regard the film seems weak and even frustrating. Despite being billed as the star Beatty is not really seen all that much especially during the first hour and in some ways the film comes off more like an ensemble drama. Also, having women fall for him after literally just setting their eyes on him seemed exaggerated and overdone. Beatty has all the necessary leading man qualities, but in this instance I don’t think he was right for the part. His performance is too reserved and aloof. I didn’t see him conveying the deep seated anger that the part demanded. In many ways it is De Wilde who gives a far stronger performance and steals the film. His boyish face and charm makes for a fantastic contrast to Beatty’s. Lansbury is sensational. She was only in her thirties at the time, but plays a woman in her fifties and does so convincingly as well as putting on a good accent. Two of her best moments come when her husband brings home three homeless men for the holidays and she insists they only want money and not the comfort of human companionship that her husband believes and the way she proves it is amusing. The part near the end where she defends her eldest son despite all his ugly flaws is brief, but strong and one of the film’s defining moments. Saint is also excellent in support and so is Madame Spivy. She was a bar owner in real life and plays one here. She had a masculine build and a very no-nonsense demeanor, which comes out when she throws the under aged Clinton out of her establishment. Director John Frankenheimer does well with the material. The on-locations shooting done in Key West, Florida is striking particularly at the beginning. His use of a rain storm makes a particularly strong dramatic sequence even stronger. However, the screenplay was written by William Inge and based on a novel by James Leo Herlihy. Inge was a noted playwright and the script seems more suited for the stage as it is quite talky and lacking in cinematic elements.